Show your pride in America and fly the red, white, and blue outside your business with these patriotic flags! Whether it’s the Fourth of July, Veterans’ Day, or just any other day of the year, you can never go wrong with these USA themed banners. Use to show your appreciation to military personnel and veterans, or simply to show your pride to your community. 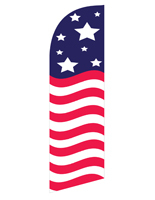 These patriotic flags and banners come with 8’-14’ poles and a variety of bases. Ground spikes are convenient for planting into a lawn or patch of dirt outside a store, while weighed water bases are perfect for paved areas like parking lots or sidewalks. Each American-themed model is incredibly easy to assemble, with most units only containing 3-4 parts. Just attach the aluminum pole pieces and slide your patriotic flag over the top to assemble. The entire setup is incredible lightweight and easy to move! So, which design will you pick?